So during May I discovered an eyeliner which has actually been in my stash for over a year, but one which I’ve not really used. 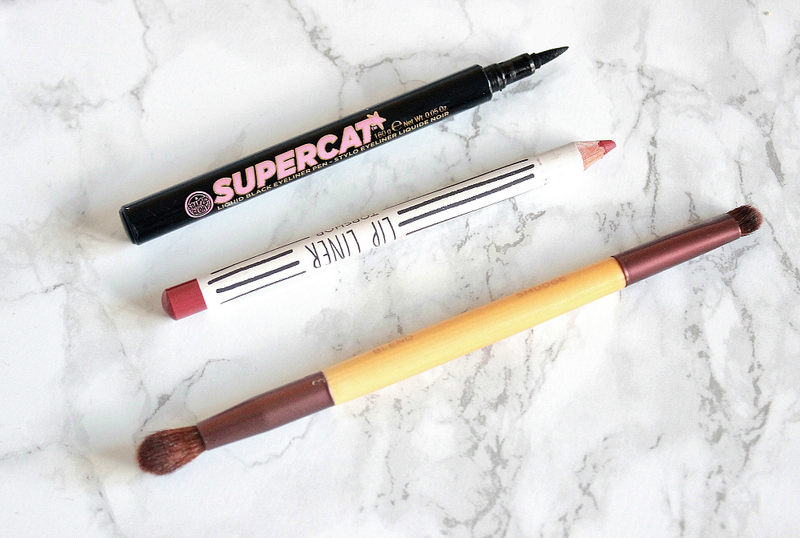 The Soap and Glory Supercat eyeliner came free with an eyeshadow palette that they had as one of their fantastic x-mas gifts two years ago and my mum bought it for me as part of my birthday present. I have never been a huge fan of pen style liquid liners because of how quickly they seem to dry out, however this one has been going strong since I opened over 12 months ago - I was half sure it had already dried out, but nope that was not the case! The nib is probably the reason it is in my favourites, it shape means it is easy to draw thick or thin liner on. The colour is black enough for me to give it the thumbs up and for the price (£6.00) this is certainly on the liners-I’d-buy-again list. A brand new product in my collection is the Topshop lip liner in Beehive (£5.00) and it is certainly a favourite, what with the affordable price and the creamy formula. Beehive is hard to describe, it’s somewhat a MLBB shade mixed with a tinge of dusty rose and a dash of a deep orange. It’s very flattering, non-drying and gives the appearance of fuller lips too. A full review will be coming your way soon! This ecotools duo brush which I reviewed here has been used every single time I’ve done my makeup. These eyebrushes are some of the best around and considering they’re available for such a budget friendly price is amazing. Super soft and the perfect size, I really couldn’t ask for more. Please excuse that the Beautyblender (£16.00) isn’t washed properly, I was in a bit of a rush, but anyways once again this has made it to the favourites, I now own three different sponges and the other two just can’t top this one. No matter what, it managed to blend out foundation, concealer and cream products wonderfully well. 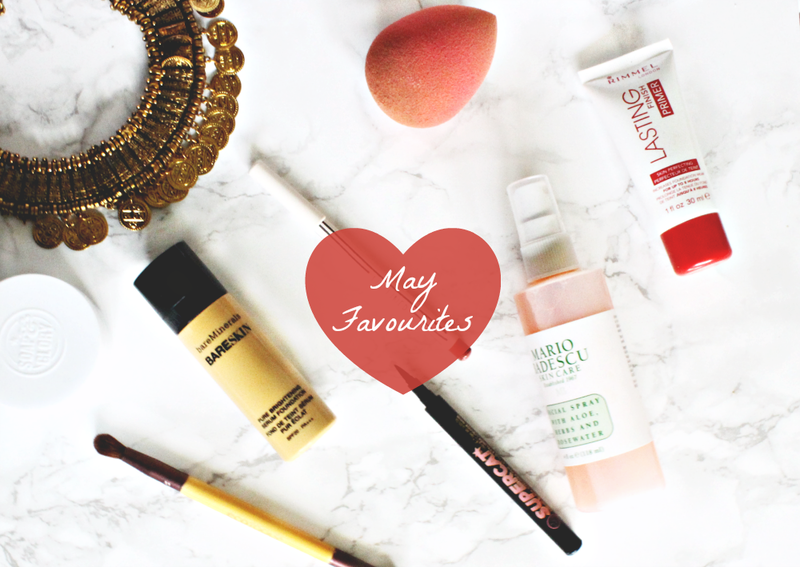 I’ve been wearing some heavier foundations this month to events and for longer days out, yet despite the thicker texture I always get a flawless finish with this damp sponge! One problem I had with it though is that this is a ‘red carpet’ l/e one which looked so pretty in the box (I got it on sale of course) and the first time I washed it SOO much colour ran out! Which is a shame as for the price the colour should remain y’know. The Rimmel London Lasting Finish Primer (£6.99) has not only made foundation application smoother but it also does pretty well at what it’s name suggests. It’s creamy and feels lovely on the skin. Sure it’s an extra step, but it’s the first primer that I’ve actually thought is worth that extra bit of effort. 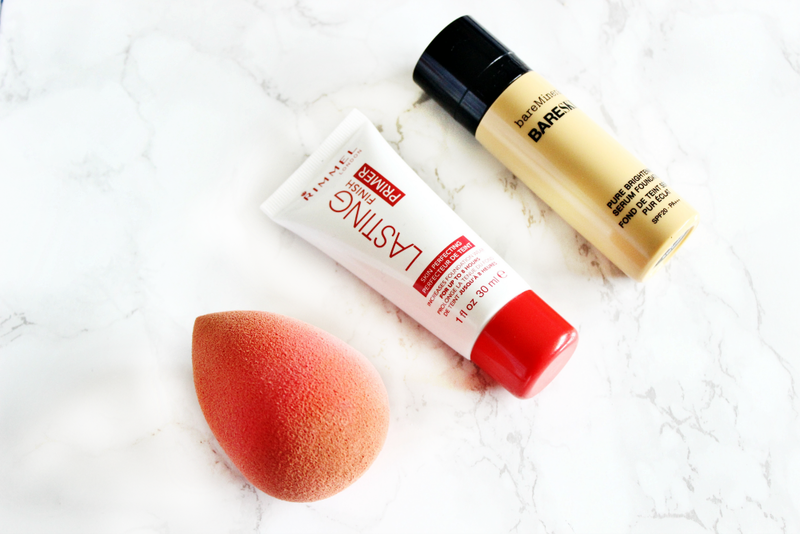 The final makeup product is the bareMinerals bareskin serum foundation (£26.00) which I reviewed here a good few months ago. It’s been a while since I’ve used it, but throughout May I’ve really enjoyed how quickly and effortlessly it evens out the skintone whilst adding a glow. Unfortunately it doesn’t bode well with the dry patches around my nose, but as long as I avoid that area it looks fantastic and feels like nothing on the skin. The fact that it has SPF in it too also makes it wonderful for an everyday base. 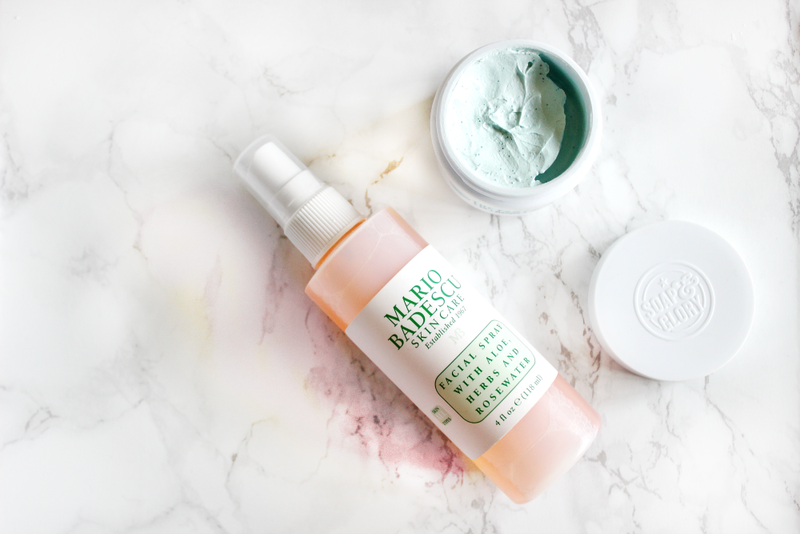 On to my two skincare favourites and to start with a brand new product - the Mario Badescu Facial Spray (£5.95). I have a full review planned for this but in short it is a more effective, cheaper, ethical and good-for-your-skin alternative to the MAC Fix+ Spray. A wonderful makeup finishing spray which adds a light dew to the skin and merges any obvious powder well into the skin. It also smells so soothing and throughout exams I was spritzing this lift, right and centre! The final favourite from May is the Soap and Glory The Fab Pore 2-in1 facial mask and peel (£10.00). It is meant for oily skin so I have been using this roughly every other week, mainly when my skin is feeling particularly congested and I love how it makes my skin feel. Refreshed and super clean. It can be a tad drying and it is in NO way a peel (believe me I’ve tried, t’was confusing) but overall it works well and does what I need it to do.